By: John Ryan, BSME, P.E. Golf cart accident frequency has increased dramatically over the last 20 years. A study by Watson, Mehan, Smith, and McKenzie ("Golf Cart-Related Injuries in the U.S.", American Journal of Preventative Medicine, 2008) of NEISS data found 147,696 people were treated in emergency rooms for golf cart accidents between 1990 and 2006. There were 5772 golf cart-related accidents in 1990, but by 2006 this number had increased to 13,411. Child injuries or deaths accounted for over 31% of the golf cart accidents during this time period. 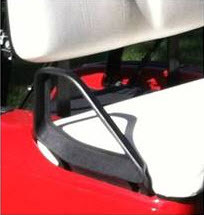 Ejection from a golf cart is the most common mode of injury in golf cart accidents. Often it is the passenger of golf carts who is ejected from the cart. Drivers with a firm grip on the steering wheel, as well as advance knowledge of when a sharp turn is going to be made can anticipate the forces and hold on to the steering wheel for support. 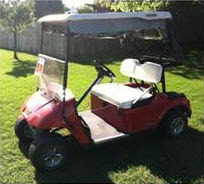 Passengers in golf carts without seat belts or adequate bracing and grips can easily be ejected sideways from a golf cart when the cart makes a sudden left hand turn. Another mode of injury in golf cart accidents is an overturn of the golf cart. This is more often a tip to the side where the golf cart ends up on one side or the other. In these cases, the driver and/or occupants may be ejected, or partially ejected and crushed during the roll over event. Even if the occupants are contained in an overturn, the lack of doors or other side containment allows limbs to become crushed during an overturn. What About Seat Belts? Golf carts lack doors to contain the occupants. A simple solution to passenger ejection is a standard automotive three point seat belt. Most golf carts are not equipped with seat belts. The concept behind this strange logic is that golfers must enter and exit their golf carts frequently, making the use of seat belts unreasonably cumbersome. ANSI Z130.1 is the prominent industry standard covering golf carts. This standard, while voluntary, still does not endorse the use of seat belts in golf carts. Manufacturers' defense of golf cart accident claims is simply that their carts met the applicable industry standards, which were not even mandatory, but voluntary. This is another situation of manufacturers hiding behind industry standards. We have seen this same phenomenon with various other product standards. One example is the ANSI A14 standards for stepladders. The committee for this standard consisted of mostly manufacturer representatives. The original A14 standard literally was written to accept "the least of the least". Manufacturers have hid behind this standard for decades, producing flimsy and unsafe ladders. After a multitude of lawsuits, most manufacturers finally quit producing their low end Type III ladders altogether. The ANSI golf cart standard is another example of an outdated standard that is not protecting the best interests of the people who use golf carts. This quote is found on ANSI's website at http://www.ansi.org/news_publications/media_tips/golf.aspx?menuid=7): " According to industry experts, golf cars are considered safe when properly operated in accordance with the safety and operation warnings affixed to the machines". Imagine if that was the attitude concerning automobiles-there would be no need for seat belts, air bags, doors, or other safety features! Relying on warnings and altering operator behavior has been proven to be much less effective than creating a product that is actually safeguarded properly. One of the arguments against seat belts is that most golf carts have a sun canopy, not a true roll over protective structure (ROPS). The argument is that a seat-belted person could be crushed in a true overturn and not have the opportunity to "jump clear". The failure of the roof structure is a valid concern, but the idea that people can "jump clear" is an age old fallacy. Human reaction times are insufficient in most scenarios to even begin to attempt to "jump clear". Most golf cart roll over accidents involve a tipping to the side, as opposed to a complete roll over. Increasing the strength of the sun canopy to second as a ROPS is an economically feasible design feature. With a ROPS there is no real argument against seat belts in golf carts. Standards require a passive type of restraint system and hand grips. Hip restraints are often used as passive protection on the horizontal portion of the seat. These are supposed to contain the occupants in the event of a sharp turn or rollover. These small hip restraints do not adequately contain the occupants, as the multitude of accidents attribute to. Occupants can still be ejected in sharp turns and roll over events. Most people's center of gravity will be located above these low restraints, allowing the possibility to rotate about the restraint. Lack of doors or seat belts makes these inadequate side restraints the only safeguard provided for roll over accidents or ejection in sharp turns. Studies show that children are much more likely to be ejected, in part due to their feet not reaching the floorboard of the cart. Hand holds on carts requires the occupant to use them for any sort of benefit. There is no guarantee that an occupant will grab a hand hold. Reliance on an ineffective safeguard that requires active participation on the user's part is illogical. The amount of injuries and death associated with ejection or partial ejection from golf carts indicates the need for better safeguards. Requiring ROPS , a seat belt, and doors that can help contain the occupants in an overturn will prevent countless tragedies.